It’s been brought to my attention that the title of these posts is a little misleading. Because the reality is that we haven’t actually done that much wandering. And even though we’ve been following the satnav, we’ve quite often been lost! In the old days, when we found ourselves in the middle of somewhere that wasn’t where we wanted to be, there was a lot of trying to make sense of road signs and rows about which way to turn. ‘Left or right…? What do you mean, you’re not sure? You’re the one with the map.’ It’s a very different experience these days. But the rows are still a possibility. Which is why having friends in the car with us is a very good thing. When it comes to keeping our marriage intact! On this trip, thanks to a combination of the satnav and some good old fashioned map reading, we’ve managed to find our way to Paunat and Le Moulin Neuf – which is where you will find us on the third morning of our trip, eating breakfast on the terrace in the sunshine. And is most definitely where we want to be. Fresh fruit, delicious croissant, good coffee – and as an added bonus we get to catch up on a bit of local gossip with the owner Robert, who entertains us with stories about the tensions and squabbles that go on behind the picture book facades of some of the villages in the area. And the idyll goes on after we leave. Because if there was ever a day for breathtaking scenery, today is it. Everywhere we look there are chateaus perched on wooded hillsides, village houses built into rock faces, stone cottages looking out over meandering rivers. I have never seen so many lovely buildings crammed into one bit of staggeringly beautiful countryside. Within a few miles of leaving Paunat – thinking that nowhere could be prettier – we drive through Limieul with our mouths open. On another perfect morning the houses of this lovely town are glowing in the sunshine. 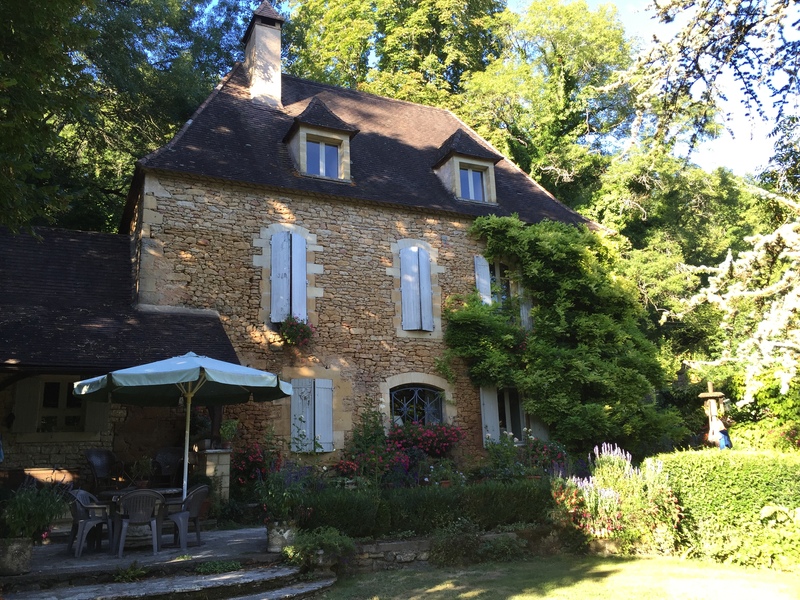 Built into the hillside, they face out across the sparkling blue waters of the Dordogne. It’s very tempting to stop and explore. But we’re on a mission and not to be distracted. We’re heading for the Chateau de Marqueyssac. This famous chateau is built on the top of cliffs looking out across the Dordogne valley. It’s a stunning building in a stunning location with a stunning view. But most stunning of all are its gardens. Over 150,000 box bushes cut into fantastic shapes and structures. It’s a struggle to find words to describe it. All I can say is that, even if you aren’t interested in gardens, you have to go. After we leave the gardens of Marqueyssac we head for Sarlat, a lovely town with a beautiful old centre. But by now it’s scorchingly hot, and the town centre is teeming with people, and the place we choose for lunch is ok but not great. So we don’t stay long. Back in the car and now we’re heading for our third stopover, in Montreal just south of Carcassonne in the Languedoc-Roussillon region. We’re taking the motorway for a while and, as we leave the Dordogne and head south, it’s amazing how the mood and attitude of the drivers around us seems to change with the countryside. Is it because we’ve got a car with English number plates, could there be an extra amount of anti Brit feeling post Brexit? Whatever the reason, as we pass Toulouse there’s a definite feeling of aggression from other drivers, and we’re rather relieved to leave the motorway and drive between fields of sunflowers to the hillside town of Montreal. Another night, another completely different stopover. From what we can see of Montreal it seems pretty without being a showstopper, although we’re learning on this journey not to judge a book by its cover. We park in a side square and roll our suitcases up a side street and into narrow alleyway where a wooden door in a high stone wall bears a sign that reads Camellas-Lloret. Knock on the door and it swings open and there stands the owner Colin, glass of rose in hand. Colin is a larger than life South African, married to Annie, who is from America and is petite and lovely, and between them they run this lovely B & B with great flair and charm. Colin shows us in to a village house on several levels built around a lovely courtyard. This place is quirky and modern and super stylish. We feel like we’re walking into the pages of Elle Decor. There’s a room on the ground floor crammed with lovely things for sale for house and home, a winding staircase up to bedrooms on the first and second floor, an elegantly furnished salon. Our rooms are a good size with futon beds and decent bathrooms. We leave our bags and head out to join Colin for a glass of rose on the terrace. Turns out Colin is an organiser par excellence. While we sip our wine he tells us to leave everything in his hands, that he’s booked us a place for dinner that we’re going to love, that he can help us with suggestions of where to go and what to do. When we tell him that we’re on our way to Barcelona the next day, we discover that he used to work there and knows the best way to get there, the best places to stop on our way, and the best places to go to when we arrive. Now it’s quite possible that there are people out there who might feel a little overwhelmed by this degree of intervention in their travel plans. And we did get back into the car that evening to drive to Colin’s recommended restaurant feeling a little uncertain about having our lives stage-managed to quite such an extent. But all our doubts and fears were laid to rest the moment we arrived at La Rive-Belle. Because it was unique and extraordinary and wonderful. And we would never have found it without him. On this warm summer’s evening we drove out of Montreal for about fifteen minutes, turned off the main road, and drove along a track between fields of mown hay into the middle of nowhere. Could this be right? Were we lost… again? We came to a stretch of quiet water. We had reached our destination. And a little shack of a restaurant with a terrace right on the edge of the Canal du Midi. We had arrived at La Rive-Belle at Ecluse de Herminis. The tables and chairs were basic and a little unsteady, the menu was limited, there was only one person serving. But the tables were full of locals, the sun was setting over the water, and the food was excellent. So another great day, with more unforgettable experiences to add to the rapidly growing collection. And tomorrow we head through the Pyrenees into Spain. Thanks so much for commenting. And I’m so glad you’ve enjoyed the ride! You’ve inspired me to get on with writing up the last couple of days of our trip.